Can the Threat of Entry Reduce Competition? 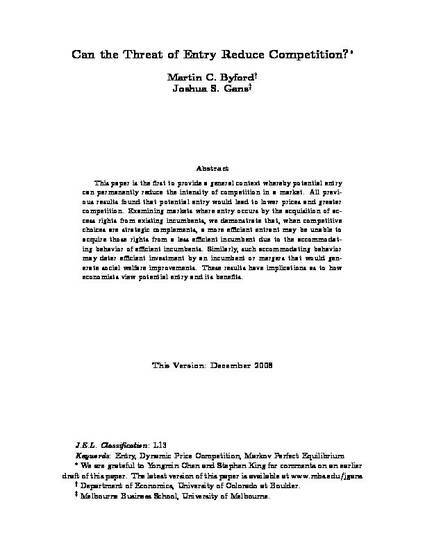 This paper is the first to provide a general context whereby potential entry can permanently reduce the intensity of competition in a market. All previous results found that potential entry would lead to lower prices and greater competition. Examining markets where entry occurs by the acquisition of access rights from existing incumbents, we demonstrate that, when competitive choices are strategic complements, a more efficient entrant may be unable to acquire those rights from a less efficient incumbent due to the accommodating behavior of efficient incumbents. Similarly, such accommodating behavior may deter efficient investment by an incumbent or mergers that would generate social welfare improvements. These results have implications as to how economists view potential entry and its benefits.